My family moved to Portland from Togo. Moving to a new environment isn’t easy. But the magic gift of a new bike helped me to get out and explore. I received my first bike through the Community Cycling Center’s Holiday Bike Drive. Rolling through the neighborhood and exploring Portland gave me such joy. 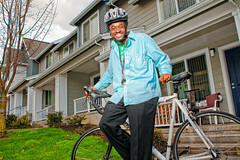 In 2010, I returned to the Community Cycling Center for the Create a Commuter program where I got my first adult size bike and learned road safety. That same year I knew that more families in our community would benefit from cycling, so I founded the “We All Can Ride” program with my friend Charles. Cycling opens new doors, provides fun, and takes me where I need to go. So I wanted to provide other New Columbia residents with the same opportunity and joy. We have a weekly community ride and we teach kids bicycle safety. Now it is time to offer New Columbia the additional resources needed for a robust cycling community. During a 10-day build, an amazing thing will happen; community members from across Portland will come together to create the New Columbia Bike Repair Hub. Now you are invited to be a part of this and join others in this effort with a donation. We have a goal to raise $15,000. For every $2 you give, the Bike Gallery will contribute $1 to the Bike Repair Hub, up to $5,000. That means your $20 can become $30, making for that much bigger of an impact.